My first stab at a greenhouse was destroyed this winter. We had 50 mph gusts combined with below zero weather. The combination was too much for the PVC fittings, which cracked. I decided to build something a little sturdier. I used Ana White’s barn greenhouse plans as a guide. I figured out at the beginning of the build that the building would be too small for my greenhouse needs. My plan was to treat the building as a modular unit, adding on as needed. What I didn’t realize until a bit later was that the building is too small to hold the stock tank for the aquaponics. Inside, the building is less than 10 feet wide. I still needed the building because I have nowhere else to house the 100 Delaware chickens that arrive next week. I managed to carry all the lumber I needed in a Honda Accord. I was still working in California at the time and my pickup was in Sacramento. 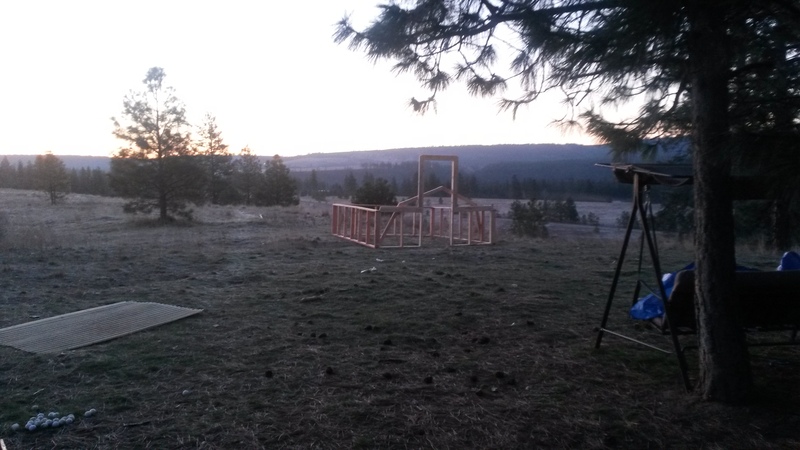 I was able to get as far as the walls and the truss that goes over the door in about a day. I had some tool challenges that I’ll get into later. 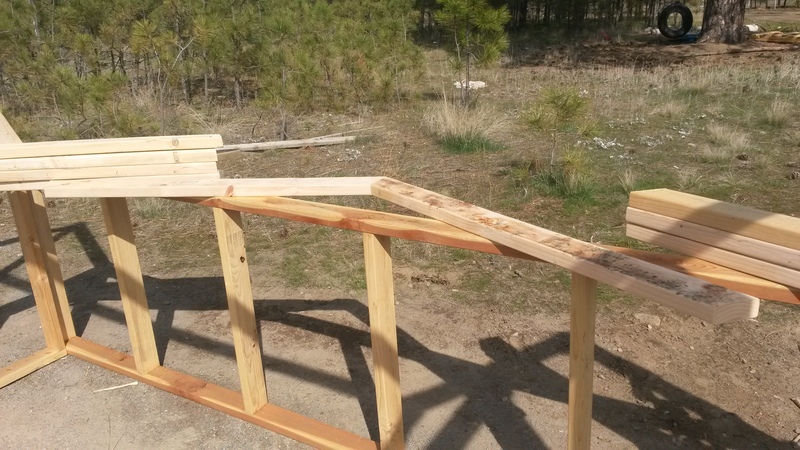 To do a barn roof, you need to make 22.5 degree cuts in your lumber. Each truss is made of four pieces of lumber and each end of each piece has to have this angle of cut. This is eight opportunities to make a mistake. I want this style of roof though. It will shed snow weight more easily than a conventional roof. Some of the cuts required in the plans can only be made to the correct length if there’s a little extra in the lumber. If your 2x4s are exactly eight feet and you cut them in half, your saw blade takes a little out and you do not have 48 inch boards. They’re almost 48 inches. This can be an issue. I’d recommend grabbing a couple extra 10 foot pieces of 2×4. There’s a hiccup in the plans as well. The drawings say one thing and the directions say another. I’m not going to get into it. Just pay attention if you use the plans. With all the above said, the plans are great. First off, they’re free. You’re getting more than you paid for in this case. My only real issue was the truss that goes above the doorway. I tried these three times and each time, the truss was too short. I assumed it was because my wall wasn’t level. I shimmed the truss and moved on. You may have noticed that the building’s location has changed. There’s a lot going on at the farm and I decided that this spot would do while we have the chicks inside. I’ll move the building at a later point. Notice that there’s no foundation. I’ll put one in when I pick the permanent site for it. Notice that I have a piece of wood between the boards that frame the doorway. I did this to make sure the door width was consistent from top to bottom. Looking back, I wish I had used one board to span the bottom of the whole wall. It won’t be a big deal when it’s on foundation, but there’s a lot of flex in the building right now. Make sure that you measure the distance between opposite corners of your building so that your building is a rectangle, not a diamond. I had assists from the wife and a kid. Most was done on my own. It can be difficult with only one set of hands. I used wood scraps to keep lumber from sliding too far or hold things in place temporarily. You can see two scraps keeping the truss from sliding off the door frame while I adjust things. This is the south end of the same truss. Notice the scrap that keeps the truss from sliding off the wall. It’s not attached to the truss, it’s just acting as a stop. This was the most worrisome part of the project. 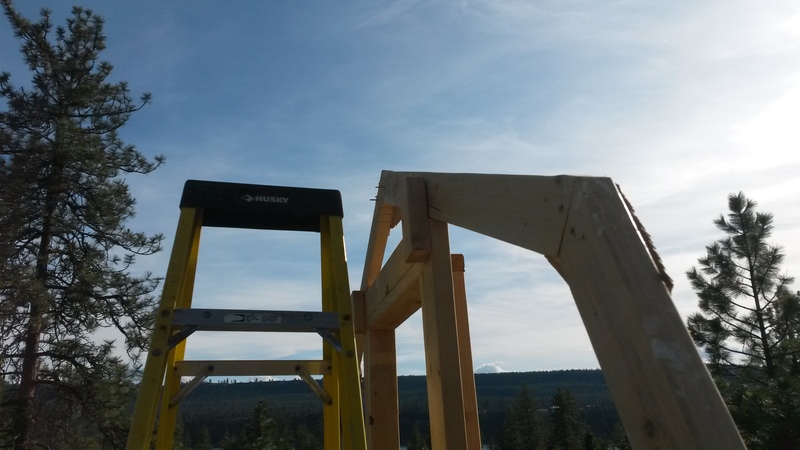 My concern was that the wind would come up and hit the trusses. 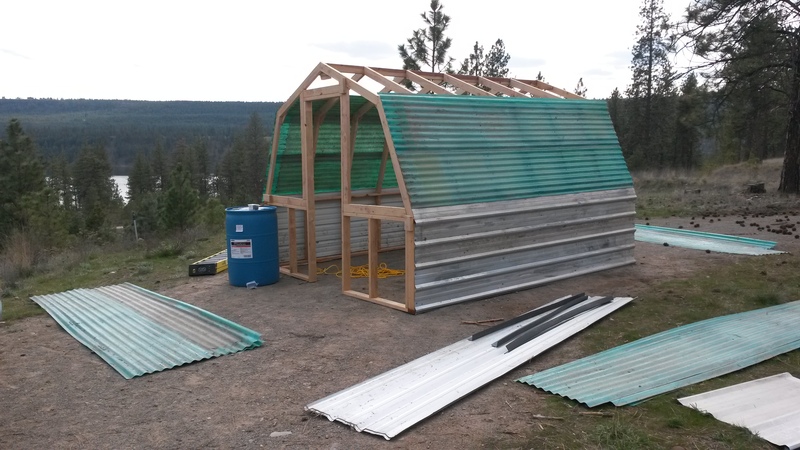 Here’s another helping hand… I put up the ridgepole and found that the two trusses were leaning out. 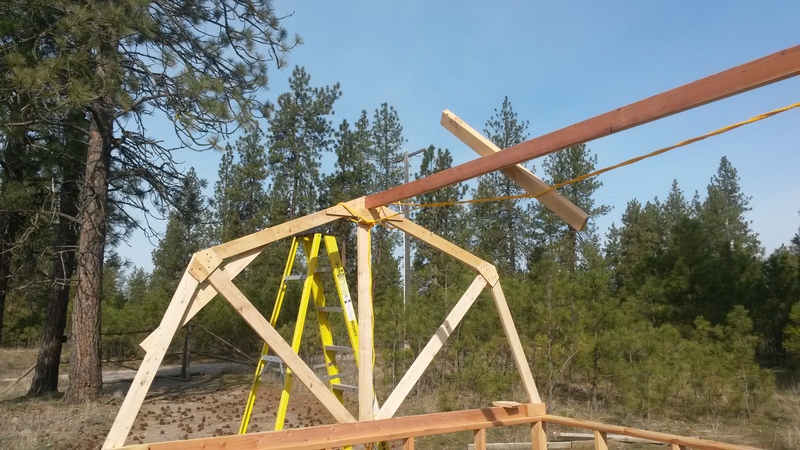 This meant that the ridgepole wasn’t touching both trusses at the same time. 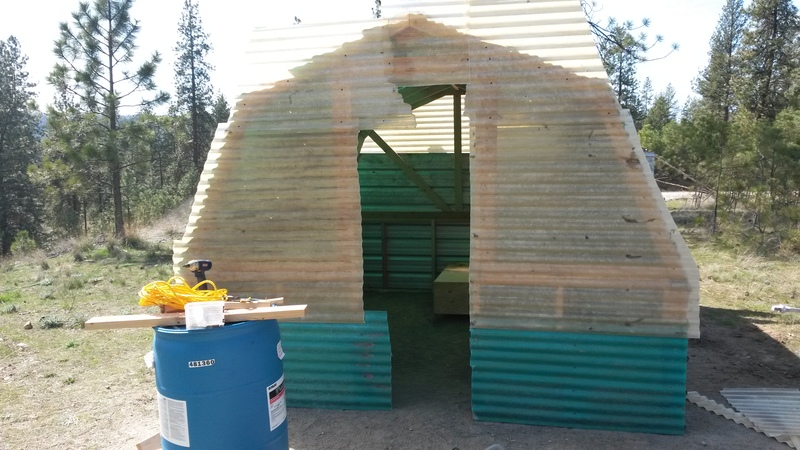 I put a loop of rope through both trusses and started twisting the loop in the middle. 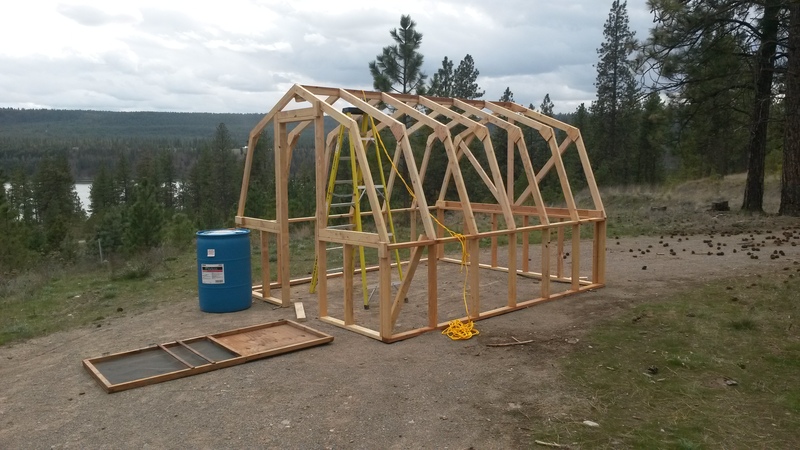 This shortened the loop and pulled the trusses closer. Voila! 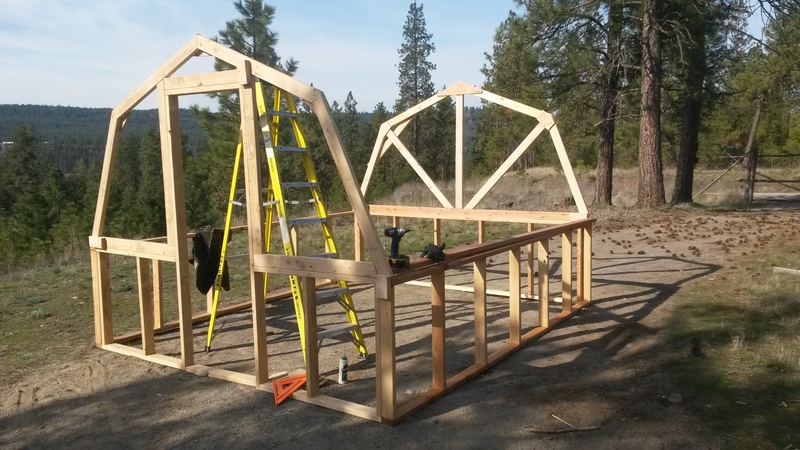 I did a lot of gussets for the trusses. Often, I’d screw one piece of the truss to the wall so it would stay still. This allowed me to control the other piece and the gusset with two hands. 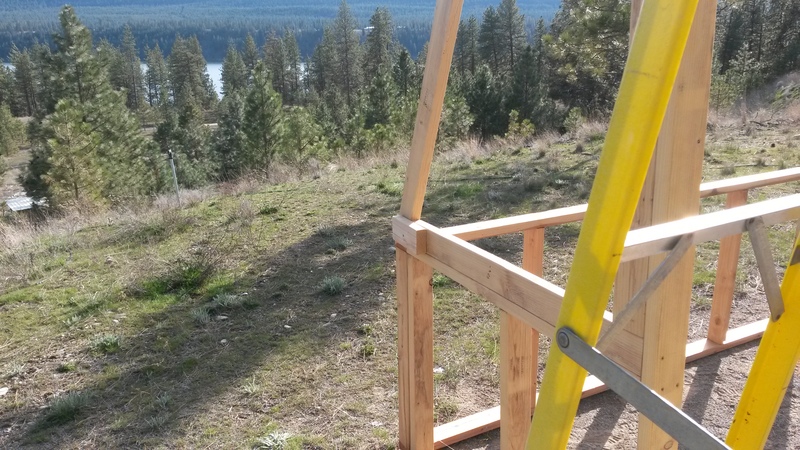 I used the rope trick to pull the ridge pole to one side. It was a bit warped. The screen door ended up elsewhere-part of a chicken run. At this point, the building had a lot of strength along the trusses, but very little strength along the ridgepole. Adding the panels (skinning) would take care of that. 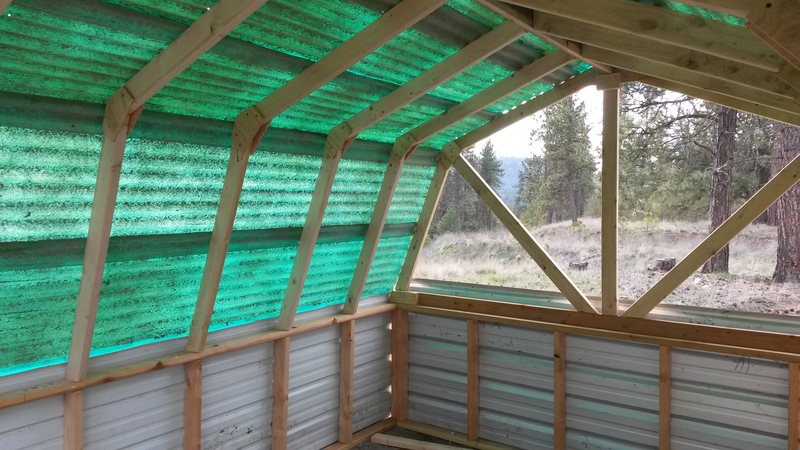 I went to a big box hardware store and found that the prices for corrugated polycarbonate and metal roof material were much higher than when I priced the project. I didn’t buy any. Later that day, I stopped at a garage sale and bought everything I needed, for $41. The corrugated stuff is old–I put a finger through it accidentally. But, it works. Some mistakes you notice when you’re framing. Other mistakes sneak up on you. 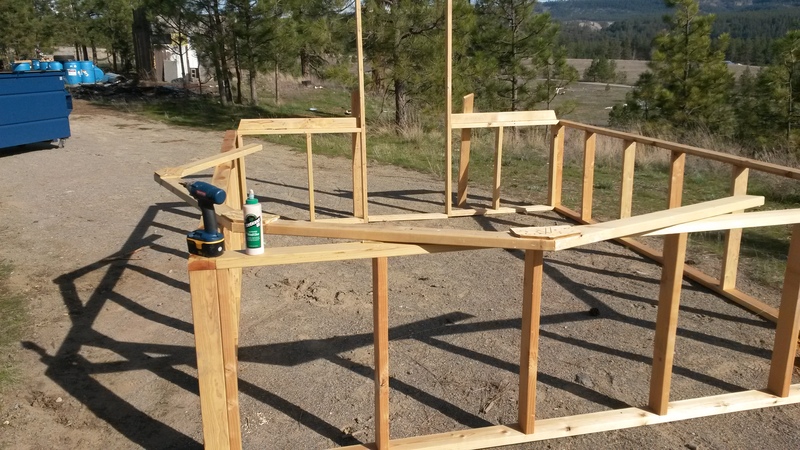 I figured out that I had a problem when I started attaching the panels to the trusses. This probably wouldn’t have happened if I had a flat place to assemble the pieces. To anyone starting from scratch, I recommend pouring a slab of concrete, even if it’s on 8 feet by 10 feet. A flat surface makes a lot of problems go away. I didn’t pre-cut the panels for the ends of the building. I screwed them on and trimmed the edges with a 4.5 inch cutting wheel on an angle grinder. You can see a bit of the brooder through the doorway. I need to seal the gaps some spray foam. A door might be nice as well. 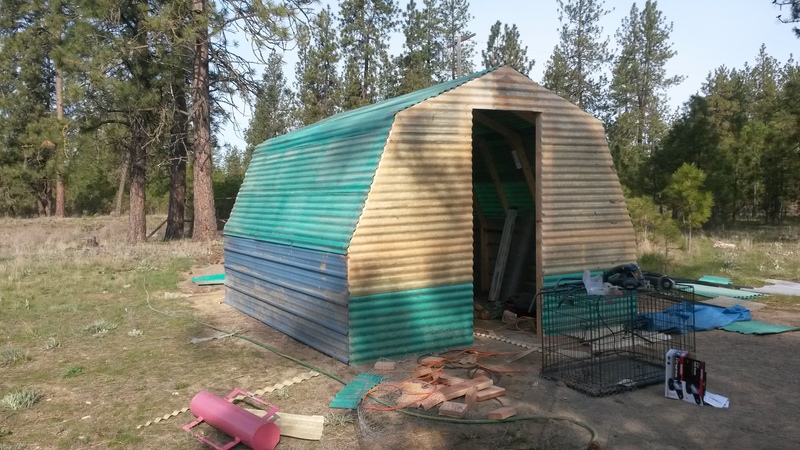 I’ll clean up the mess and finish the door after I pick up some more pigs tomorrow. 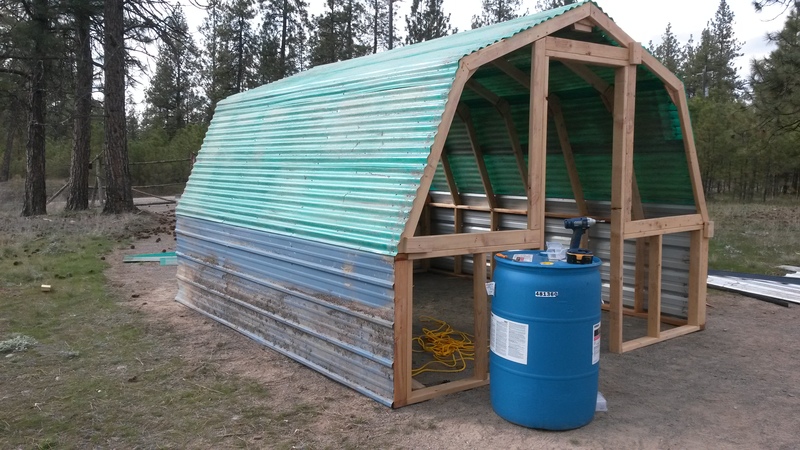 This entry was posted in Buildings/Structures and tagged ana white, barn, cheap, greenhouse, shed by admin. Bookmark the permalink. Looks good. I love seeing more of the area around your place. What a lovely place to live. Looks good! Lot of work paid off.